Axium Healthcare Pharmacy announced the official launch of its #oneteam single source referral program. The program means that Axium now accepts referrals for all hepatitis C specialty medication patients, and will perform—and complete—full prior authorization work, if permitted by health plans, even if it cannot fill the prescription. #oneteam enables healthcare providers that specialize in chronic conditions to send all of their patient referrals to Axium: ONE specialty pharmacy and ONE point of contact. It is not a prescription triage process; #oneteam is a one-stop hepatitis C medication solution that simplifies therapy management for providers with fewer phone calls and less paperwork. #oneteam may also help to reduce delays in patients starting their medication regimens and getting on the right path toward adherence, compliance and improved outcomes. 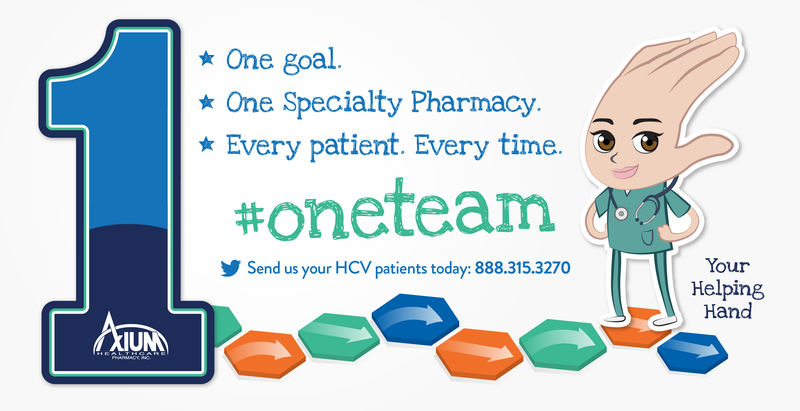 Ask about #oneteam for one-stop hepatitis C therapy management at 888.315.3395. Founded in 2000, Axium Healthcare Pharmacy, Inc. is a nationwide provider of specialty pharmacy services. A wholly-owned subsidiary of The Kroger Company, Axium provides drug therapies and patient support services to treat chronic, genetic, and other complex conditions such as Hepatitis C, Multiple Sclerosis, Cancer, Rheumatoid Arthritis, and a number of others. For more information, contact Axium Healthcare Pharmacy at 888.315.3395 or visit http://www.axiumhealthcare.com.